Ahhhhh southern style collard greens!!! Such a true tribute to my childhood! 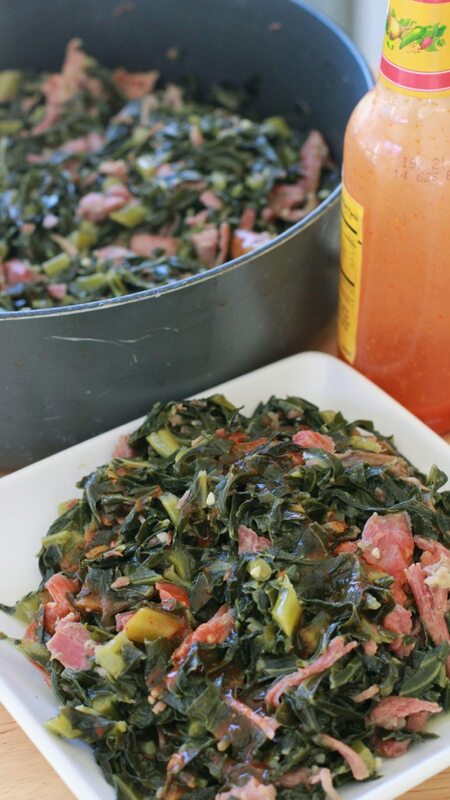 My grandmother made collard greens just about every Sunday! I’d walk through the house while pinching my nose saying “ewww collard greens again!! !” lol I actually did like collard greens as a kid but my oh my how I LOVE them now!!! 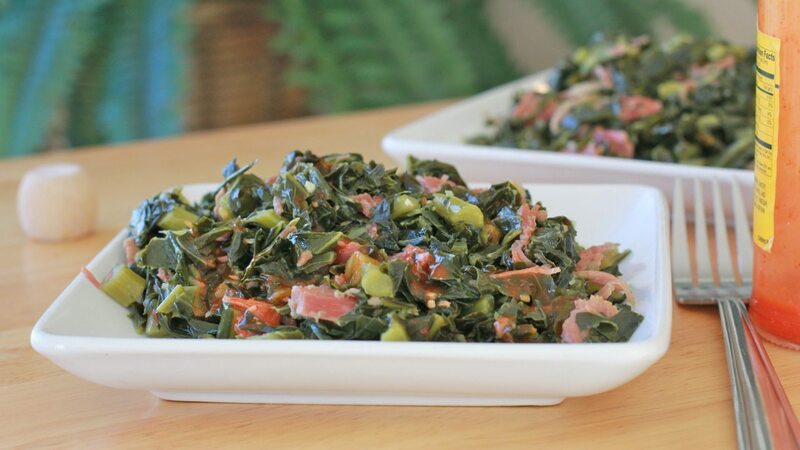 Forget the main course, I’ll be perfectly happy with a bowl of tender, flavorful soul food collard greens any day!! Douse them bad boys with some hot sauce or vinegar and lawd hammercy!! These southern collard green are the bees knees I tell ya!!!! I’ve featured this recipe before on my blog and you guys love it! It was waaaay time I remade the video and refreshed the post. 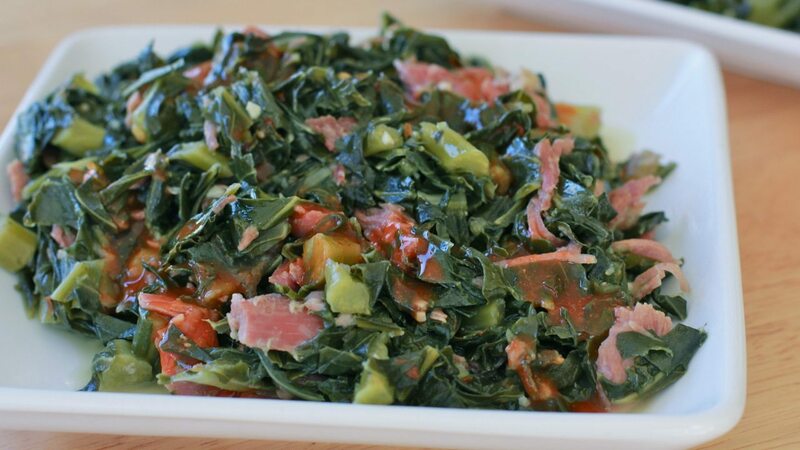 If you’re looking for a truly southern and authentic collard greens recipe that uses smoked turkey instead of ham hocks….THIS.IS.IT!! 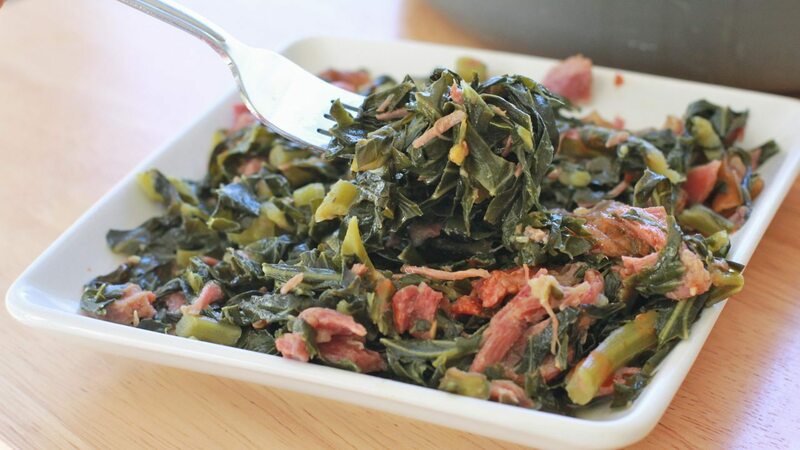 These fresh collard greens are simmered away in a rich chicken broth infused with flavors from fresh onions, garlic, red pepper flakes, and that smokey, salty turkey leg. 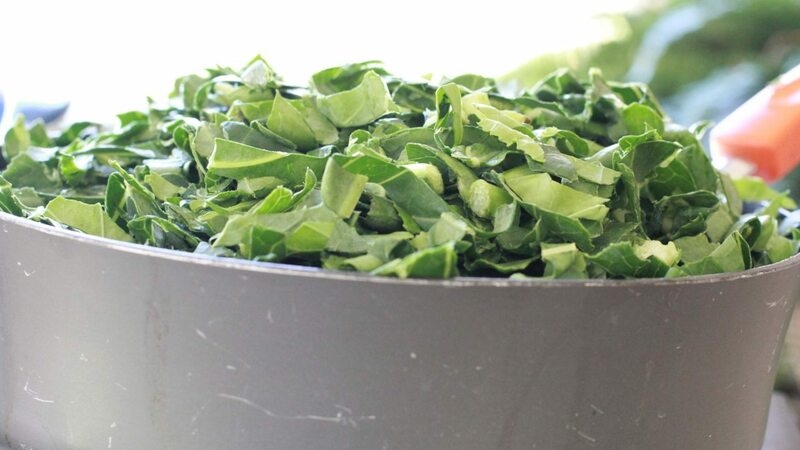 It’s these simple, non-fancy ingredients that produces some of the best collard greens I’ve ever had! I can wolf down several bowls! 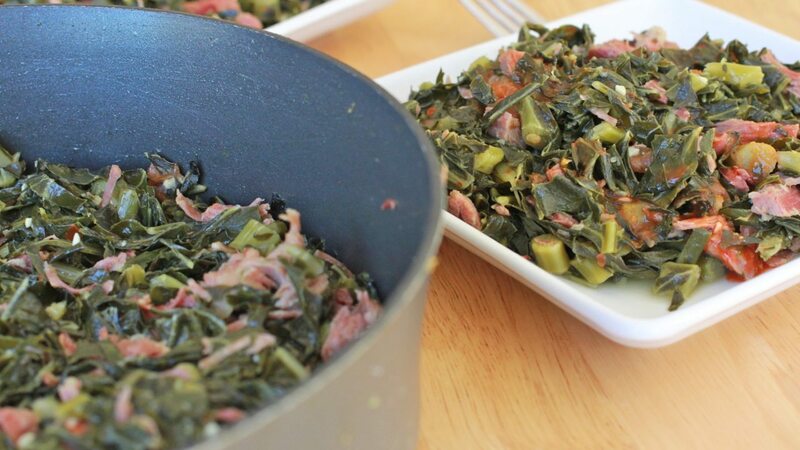 Watch me make these soul food collard greens from start to finish! 32 oz. collard greens, thoroughly washed and cut into strips. Return meat and skin back to the pot. When greens begin to wilt down, cover and simmer for up to 60 minutes or until your desired texture is reached, stirring occasionally. Thank you for the recipe! Terrific flavor… we loved it topped with hot sauce! Monique!, I love your recipes and you honey! You feel like a long lost cousin…I have a question-can I use frozen greens for this recipe?? I’m so scared to use fresh, I’ve never cooked greens before and I am sooooo intimated by the whole process. Also let me add I will be serving these at Christmas dinner. So, it’s one year later, and I’m using your receipe again. The results are just as Fabtastic ( yes, that’s a word, Lol) as before. This time, I included the garlic. It is absolutely delicious!! 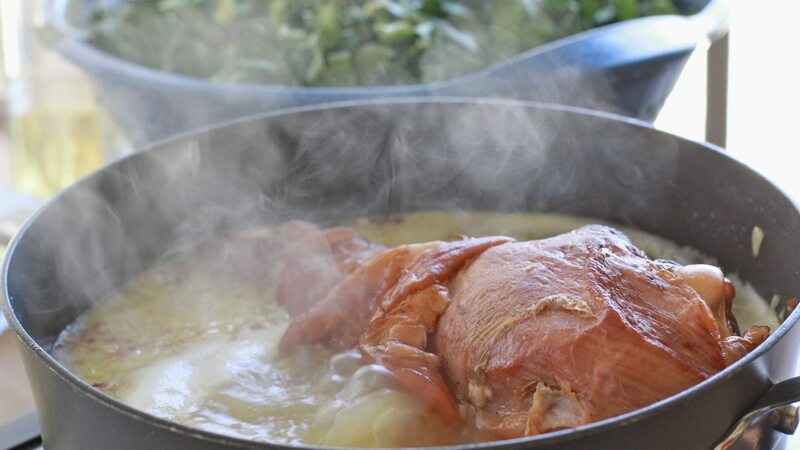 The suggestion of cooking the smoked turkey then cutting it into tiny bits is game changing. Thanks so much for this recipe and instructions; Your efforts are not in vain.